NEW HAVEN, Conn. – A huge multiracial crowd jammed inside and outside of Kelly’s restaurant on election night here to celebrate the victory of Toni Harp as the first woman African American mayor, and cheered also for the mayors elected in New York and Boston. In all three cities, the labor movement joined with community forces to elect a candidate running on a program prioritizing people’s needs. 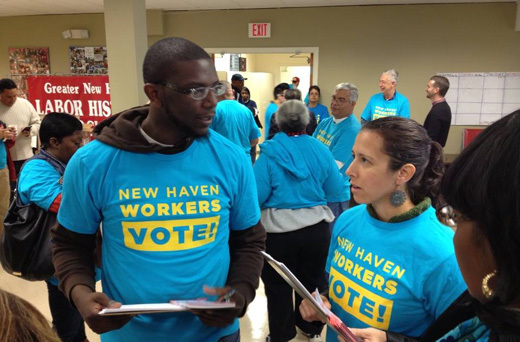 Led here by New Haven Rising, unions of Yale University workers and community groups, hundreds of volunteers knocked on doors across the city this summer and fall to discuss issues and organize a large voter turnout. Labor-backed Harp won the primary and then went on to win the general election. In addition, the 20-member super-majority of union members and allies on the Board of Alders elected in 2011 was retained. Also, charter revision to give residents a larger voice in government passed overwhelmingly. Two elected members were added to the mayor-appointed Board of Education, a civilian review board was established, 10 points were added for city residents who pass civil service exams, and mayoral appointments will be approved by the Board of Alders. These victories and fulfilling the aldermanic priorities for jobs, youth services and an end to violence have not come easy. New Haven’s population is majority Black and Latino. Since the flight of industry, Yale University and its teaching hospital have become the dominant employers with constant expansion into surrounding neighborhoods displacing working class families. After two decades in office, outgoing Mayor John DeStefano decided not to run again, creating an open field with five candidates in the Democratic primary. Harp’s candidacy was unanimously endorsed by the union/community alders. 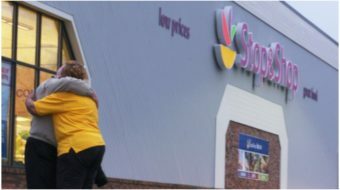 This led to a hot and heavy primary election filled with union-bashing and personal attacks against Harp, which were rejected by the majority of voters. 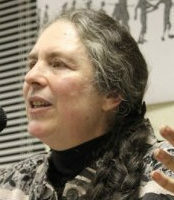 Opposition candidates organized as “Take Back New Haven” claimed the alders were controlled by a “union machine” from the suburbs. In fact, the alders who are union members were elected as a result of unprecedented outreach door to door in each ward, exactly the opposite of a back-room machine. They have brought into the community the skills they learned representing co-workers on the job as service, maintenance, clerical and technical workers at Yale and as members of AFSCME and 1199. They are neighbors with as much stake in the future of the city as anyone else. Most are African American, many are women. A longtime state senator with a strong progressive voting record, Harp came under attack for tax problems around her late husband’s business. After she won the five-way Democratic primary, these attacks escalated in an apparent attempt to keep down the vote. Harp’s years of community service and her endorsements by legislators and the governor ensured her victory over Alder Justin Elicker who switched and ran independent after coming in second in the primary. His votes came primarily from wards with large white homeowner professional populations who liked his balanced budget program. While Harp won with 54 percent of the vote, a campaign of education and discussion about race and the role of unions will be important post-election to move the city forward. A major accomplishment of the union/community alders during their first term was the establishment of New Haven Works, which to date has helped over 100 residents get jobs at Yale, with a goal of 1,000 jobs in the next two years. Efforts are being made to get comparable commitments from other employers. New Haven Rising activists are preparing for a new push to create jobs with livable wages and the right to a union. Activists who became involved during door knocks for the election plan to bring their message to Harp and the alders that to restore hope and opportunity more initiatives are needed to bring an end to the massive unemployment facing youth and adults, especially in largely African American and Latino wards. Young people themselves were a major part of the door knocking all year long leading up to November’s general election.